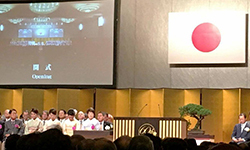 During a visit to Japan in early November, Dean J. Douglas Bricker represented President Ken Gormley and Duquesne University at the celebration of the 60th Anniversary of the founding of Tsuzuki Gakuen Group, which is made up of multiple Japanese universities with partnerships with many schools around the world. 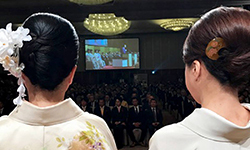 In addition to attending the celebration, which took place at Daiichi University of Pharmacy in Fukuoka, Japan, Dean Bricker also taught a class and reviewed the collaboration established with Daiichi's Department of Pharmaceutical Sciences. Dean Bricker also visited Kobe Gaukuin University, and presented a plaque commemorating the 25th anniversary of the faculty and student exchange agreement between Kobe Gaukuin Department of Pharmaceutical Sciences and Duquesne University School of Pharmacy. He also obtained signatures on a document that will extend the agreement for another five years. According to Dr. Bricker, numerous Duquesne University School of Pharmacy faculty members have taught at Kobe Gaukuin for six-week periods over the course of the agreement, including Dr. Bruce Livengood, Dr. Larry Block, Dr. Vincent Giannetti, Dr. David Tipton, Dr. Patricia Keys, Dr. Mary Mihalyo, Dr. Khalid Kamal and Dr. Michael Perry.